One of the oldest and most successful Extreme Sailing Series teams is set to be among the ten boats jockeying to win the GC32 Racing Tours’ 2019 season. Team Oman Air supported by EFG Private Bank Monaco will compete on the five event GC32 Racing Tour with two new crewmen. Returning are the team’s British project manager, mainsail trimmer and tactician Peter Greenhalgh, together with Kiwi headsail trimmer Stewart Dodson and long standing crewman Nasser Al Mashari, in charge of board control. 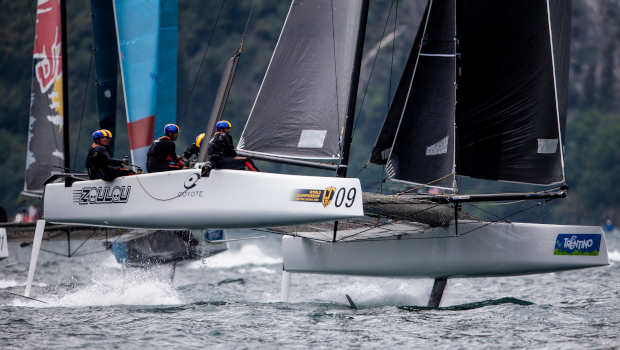 They are joined by Adam Piggott from the UK, who is foil trimmer having previously sailed on a variety of GC32 teams, including Pierre Casiraghi’s Malizia – Yacht Club de Monaco and Red Bull Sailing Team in 2017. Recruited as helmsman is New Zealander Adam Minoprio. In 2000 Minoprio became the youngest ever Match Racing World Champion and he has since sailed two Volvo Ocean Races and been part of the Luna Rossa and Groupama Team France America’s Cup challenges. But Minoprio is also one of the most experienced and successful GC32 helmsmen. He was steering when SAP Exteme Sailing Team won the Extreme Sailing Series in 2017 and finished third last year. The season before he had claimed several events on the GC32 Racing Tour standing in for Franck Cammas on NORAUTO, after a winter when the French America’s Cup team was training daily on GC32s. In fact Minoprio won the very first GC32 event back in May 2013. “Arguably Adam is the most experienced helm out there, after all the training he had with Cammas,” observes Greenhalgh. “In 15+ knots, he still stands out as noticeably the best.” In terms of Minoprio’s track record with SAP against his new team – in 2017 Oman Air finished third when SAP won, but the tables turned last year when the Omanis came home second overall, albeit only on countback from SAP. “He will bring another element of consistency in the windy conditions,” continues Greenhalgh of their new helmsman. To get up to speed with their new crew line-up Team Oman Air supported by EFG Private Bank Monaco will be training in Villasimius during the first week in May and will also be putting in a few days prior to the start of the first event of the 2019 GC32 Racing Tour, the GC32 Villasimius Cup, taking place over 22-26 May. The arrival of heavyweight competition from the Extreme Sailing Series has also been a wake-up call for the GC32 Racing Tour teams, including those with owner-drivers. Having come second in the GC32 Racing Tour’s owner-driver championship in 2018 and finish third on the overall podium, France’s Erik Maris returns with his Zoulou team. He has retained the same crew, once again led by America’s Cup veteran Thierry Fouchier and including several who were part of Franck Cammas’ last French challenge for the America’s Cup – Thomas le Breton, Bruno Mourniac from the French Youth AC crew and bowman and GC32 veteran, Nicolas Heintz. Already Zoulou has put in 10 days of training in Villasimius and has another session in over Easter scheduled. Further team announcements will be made over the next weeks.